Three breeds taken off, one added, plus 'serious concern' for Dales ponies and North Ronaldsay sheep. Longhorn cattle have increased sufficiently to be removed from the list. Two breeds of sheep and one breed of cattle are being removed from the annual 'Watchlist' compiled by the UK's only charity dedicated to the preservation of Britain's native farming livestock. However, the Dorset Horn sheep is placed on the list for the first time and concern grows for the future of Dales ponies and North Ronaldsay sheep, both of which are now classified as being 'Critical'. “We are delighted that numbers of Longhorn cattle, Wiltshire Horn and Kerry Hill sheep have increased sufficiently to be removed from the list,” said Robert Terry, the Executive Director of the Rare Breeds Survival Trust. In addition to the Longhorn, there are several other success stories. Shetland and the Lincoln Red populations are downgraded from Critical to Endangered. The Gloucester has increased significantly in numbers and moves to Vulnerable, along with the White Park. 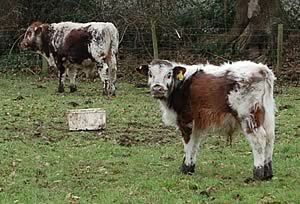 The Traditional Hereford, Beef Shorthorns and Red Poll are downgraded to At Risk. Breeds where numbers have dropped sufficiently for them to move into a rarer category are the Dorset Down, Hill Radnor, Soay, Devon and Cornwall Longwool, Oxford Down, Shropshire and the Whitefaced Dartmoor. Breeds proving to be more successful and which have increased in numbers are the Balwen, Llanwenog and South Down. As mentioned earlier, the Wiltshire Horn and Kerry both go off the Watchlist. In contrast to the experience of the Dales pony, the Fell moves from Endangered to Vulnerable and may drop another category next year if numbers continue to improve. All poultry breeds stay in the same categories due to lack of updated information because registration data is not available. However, the Trust expects to receive information from a recently distributed avian influenza questionnaire, which will be used to update the watch list next year. Female registration data was not available for the 2006 list so the annual survey has been used, as in previous years. The RBST is working closely with the British Pig Association and updated information, based on female registrations, should be available for the 2007 watchlist.